Catherine DeCorte Service Details - Seaforth, Ontario | McGlynn Family Funeral Home Ltd.
McGlynn Family Funeral Home Ltd.
— McGlynn Family Funeral Home Ltd.
"Our thoughts and prayers are with you all." "Our sympathies are with you at this time. " — Bob and Ruth Campbell. Catherine passed away peacefully, surrounded by her loving family at Seaforth Community Hospital, on Monday, January 21, 2019. Born in Bakel, The Netherlands on July 24, 1936, Catherine Maria DeCorte (née Van Bakel) of Egmondville, was in her 83rd year. Beloved wife of the late Cor DeCorte (November 11, 2018). Loving Mom of Ida and Robert Tilker of Moorefield, Martha and Hank VanDieten of Seaforth, Martin and Nancy DeCorte of Elmira, Ken and Elaine DeCorte of Seaforth, Corinne and Tony Diemert of Clarkston, MI, Mike and Carla DeCorte of Seaforth and Tony and Sandra DeCorte of St. Joseph. Cherished Oma to 23 grandchildren and 11 great-grandchildren. Catherine is also survived by her siblings Herman (Grada), Hank (Alice), Martin (Julie), John (Mary), Jo (Cinth), Tony (Nellie), Casey (Helen) and Cor's brother Frans and two sisters-in-law Miet and Lies. Predeceased by one sibling, Wilhelmien Poppe and 21 in-laws. Catherine and Cor have been blessed with a large circle of great friends and neighbours. Visitation will be held at McGlynn Family Funeral Home, 87 Goderich St. W., Seaforth, 519-527-1390, on Wednesday, January 23, from 1-4 and 7-9 p.m., and will continue on Thursday, January 24, from 10 a.m. to 10:45 a.m., prior to the service at the church. To honour and celebrate Catherine’s life, Funeral Mass of Christian Burial will be held at St. James Catholic Church, 22 Victoria St., Seaforth, on Thursday, January 24, at 11 a.m., with Fr. Clare Coleman officiating. A reception will immediately follow at the Seaforth & District Community Centre and interment will take place in St. James Catholic Cemetery in the spring. Interment will take place in the spring. We encourage you to share any memorable photos or stories about Catherine. All tributes placed on and purchased through this memorial website will remain on in perpetuity for future generations. Tony and Sandra.....my thoughts are with you during this troubling time! 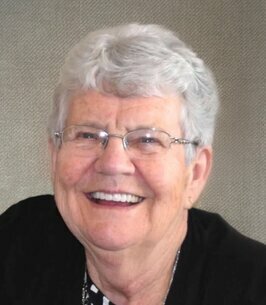 Sue R.
Corinne and Tony, We are deeply saddened by the loss of your lovely mother. Sending you my deepest sympathy. I will never forget her infectious smile. You have our most sincere sympathy. We are so sorry to hear of Catherine's passing. Our sincere condolences to the entire DeCorte family. Dear Family: My thoughts and prayers are with you all at this sad time. Please accept our heartfelt sympathies on the loss of your loved one.